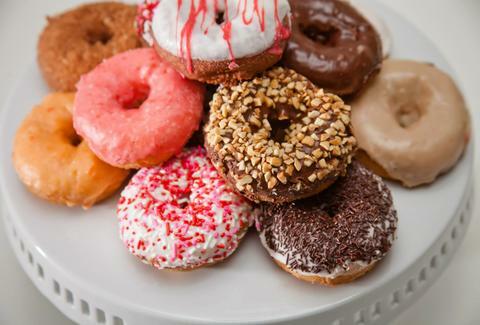 It's official: donuts are having a moment in San Diego. People are lining up by the baker’s dozen to get some of the city’s most highly praised breakfast sugar bombs, and for good reason. Pastry chefs are coming up with new concoctions and fried treats to match the seasons, pleasing everyone from vegans to sweet-toothed, full-fat fiends. From tried-and-true donut shops to the city's newest Instagram-worthy stops, we’ve rounded up the finest donut shops south of Route 52. 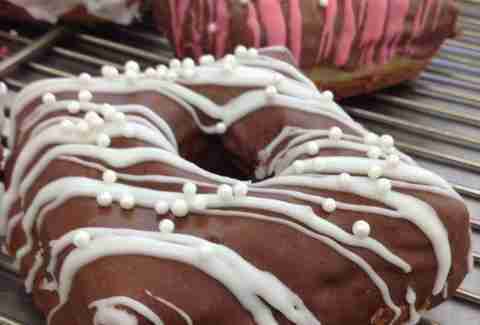 VG has been a North County staple for nearly 50 years and offers some of the most delicious donuts around. They’re baked fresh daily at 4am and 4pm, so you’re guaranteed to get a fresh donut any time you stop by. 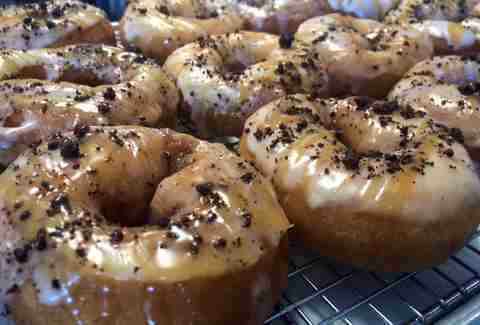 VG’s puts an emphasis on traditional donuts, so the glazed twists and chocolate old fashioneds are no-frills, straightforward, tasty treats. On any given day, the Donut Bar will have a line out the door, and it’s easy to see why. (We voted it the best donut store in California.) Not only are the donuts doughy bliss, the shop is a social media savant’s dream, from the modern Homer Simpson art in the bathroom to the Big Poppa Tart, a giant pop-tart donut. It weighs a pound and is stuffed with strawberry jam and an actual, full-sized Pop-Tart, then drizzled with jam and even more chopped Pop-Tart. Besides being incredibly punny, Donut Panic is also great at glazed donuts. 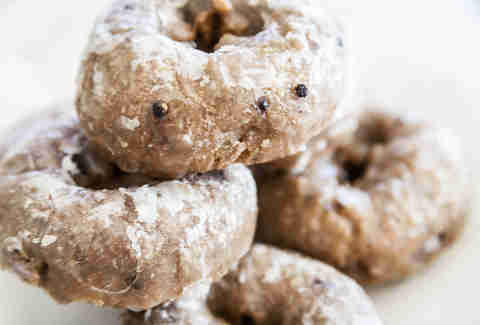 They offer almond, Earl Grey, maple bacon glaze, and even rosewater cardamom. They also have a ton of vegan donuts, ensuring that even people with food allergies and self-imposed dietary restrictions donut (yay puns!) have to give up donuts. This is probably about as healthy as donuts get (although you’d never think it) -- Nomad has an entire menu section dedicated to vegan options alongside its list of specialty donuts that changes daily. 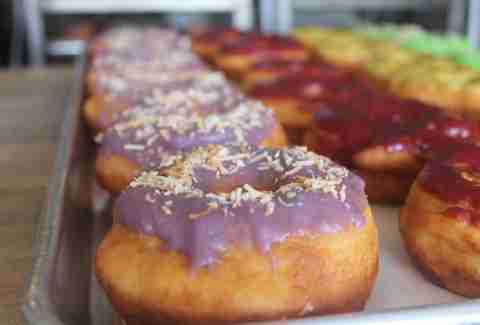 We recommend the Ube Taro Coconut donut (vegan and otherwise). The purple color comes from taro, a root vegetable with a nutty flavor. 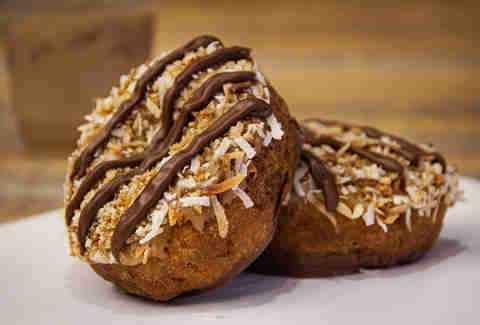 Combined with coconut, this donut is unexpected and original. The Tres Leches Donut is a hybrid between a cake and a donut. Before being fried, the dough is dipped in sweet milk. Then, it’s doused in a vanilla bean and caramel glaze and topped with chocolate nibs. Your body needs this. Just get there before it sells out. The blueberry donut is a huge improvement on the blueberry muffin. The moist dough is sprinkled with... you guessed it, blueberries. It's covered in sweet glaze, giving each bite a nice crunch before hitting the moist blueberry innards. Be sure to have some loose change or cash when you go since Donut Stop doesn’t take cards. The only square donut to land on this list is the Peterson’s Pillow, and it’s the things that dreams are made of and what real pillows should be made from. The pillow is a cross between a croissant and a donut and comes in five different flavors: cinnamon sugar, glazed, vanilla, chocolate, and maple. It’s available Thursday through Sunday, though Peterson's is open 24/7 for a middle of the night donut fix. Ellen Wright is a freelancer at Thrillist who would take a chocolate old fashioned over a cronut any day. Follow her on Twitter: @PacificPolished.